Find other destinations that offer GO Airport Shuttle or search for other transportation providers at Phoenix Mesa (AZA) airport. Phoenix Mesa Gateway offers two large parking lots with more than five thousand available spaces. We provide door-to-door service for you to book and share rides to cut down on traveling costs while you are going to the Oakland Athletics’ game at the Hohokam Stadium. Experienced drivers handling private van service; hire van to ride to the Mesa Arts Center or the Arizona Museum of Natural History in Mesa, Arizona. We have professional drivers at our employ who will get you there in no time at all; preferred destinations in Mesa include the Mesa Historical Museum and Mesa Arizona Temple. Local personal drivers available at every tourist spot; just pickup the phone whether you are at the Mesa Amphitheatre or the Mesa Grande and we are there! Plenty of seating space along with the fastest rides; dependable and always on time, our private SUV drivers will take you to your baseball games on time at the Hohokam Stadium. Book taxicab with great local experience and best drivers for the most reliable pickup and drop and ground transportation to tourist spots in Mesa. Live the dream in our private limousine; experienced chauffeurs and marvelous rides at highly ambitious prices – just for you. Book before arrival and you will depart with the experience of a lifetime. Hire buses for more than 10 people; visit Golfland Sunsplash or the Champlin Fighter Museum in Mesa with everybody in our buses for hire with best drivers to take you there. 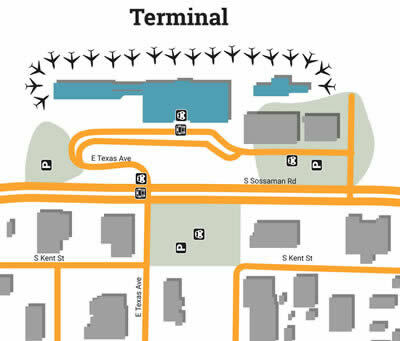 Navigating Phoenix-Mesa Gateway Airport has never been easier. Know where you’re going before you even land and get in and out without a hitch. At AZA airport shared ride shuttle is available through SuperShuttle Phoenix-Mesa and private limousine services are available at the front lot. There are five shuttles on one lot that take passengers between the two lots and the front entrance of the terminal. There is a small lot located near the front entrance for handicapped parking, drop off and pickup, and shuttle services. Overnight parking is available for an additional cost in a separate lot. Shuttle services are available at no additional cost. There is also a private lot for rental cars from three rental car companies: Alamo, Hertz and Enterprise. The rental car agency hub is located in the main terminal station and is open 24 hours. Phoenix-Mesa Gateway Airport, or AZA, just recently changed its name from Williams Gateway Airport. Mesa is one of Arizona’s major cities and it is where AZA is located. Phoenix Mesa Gateway Airport started out serving the nation as a military air station known as Williams Air Force Base. Now, the airport is a host for more than 40 companies, serves over 30 cities with non-stop services, and helps to contribute more than $1 billion to the economy of Arizona. The airport is home to advancing technology to develop an international aerospace station with aircraft maintenance and modification as well as training if pilots. Seeing more than 750,000 fights per year and nearly 1 billion passengers annually, this makes Phoenix Mesa Gateway Airport an amazing addition to the airport servicing system of America. Covering more than 3,000 acres of land, the airport house a main terminal with three major runways and 10 gates. Though they only service one major airline, they offer more than 100 domestic and international flight destinations and serve as a airport for military plane stopovers and emergency flight landings for all airlines. The airport is a key element of the community in Mesa. It is governed by the mayors offices and the tribal govenors of the surrounding local towns. One of the most important surrounding local towns to the Mesa airport is Gilbert which is a community that is very family oriented. Mesa is a highly populated city and it is home to many schools and universities. Gila River Indian community is a town rich in history and culture. Queen Creek is a nice vacation city where you can get away and just enjoy the Arizona style of living. Phoenix has seen a recent jump in population and during the housing boom was a leader in housing industry. Arizona is also the home of one of the four major BCS bowl games, as well as the NFL’s Arizona Cardinals including two major colleges University of Arizona and Arizona State University. Rides to the Phoenix Convention Center has convenient shuttle services. Most services in the airport are available 24 hours a day and 365 days in a year (excluding restaurants). There are five restaurants (only one serves alcohol) and three shops as well as a mini market and convenience store. There are two newsstands in the terminal and an ATM at each gate. There is a baggage storage area and there are luggage carts available for cost. The airport does not have pet comfort stations. Information changes frequently on available Phoenix hotel shuttle services near the airport. Please check with the airport at the information stations for more information.